Visit the Aquarium of Madeira and get to know the habitat of the Madeiran maritime world. O Aquário da Madeira, situado junto ao porto da vila do Porto Moniz representa os habitats do mundo marinho madeirense. 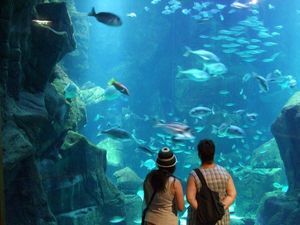 The Madeira Aquarium, next to the port of the village of Porto Moniz, shows the habitats of the Madeiran maritime world. The building of the aquarium is located in the old São João Batista Fortress, built in 1730 as a response to the pirates’ attack against the people of Porto Moniz. The aquarium is made up of 11 exhibition ponds in with representations of the various habitats of the Madeiran maritime world. The most important pond hosts around 500,000 litres of sea water and a big amount of maritime species. Rua Forte de São João Batista, Porto Moniz, Madeira. Children between 5 and 14 years old, Students or senior : 4€. Groups of more than 5 people: 5€ per person. Groups of more than 5 children between 5 and 14 years old, students or retired people: 3€ per person. Everydays from 10h00 to 18h00.